In 2013, Jemelleh Coes, as the youngest member of her school faculty and staff, was nominated to represent Bulloch County as Teacher of the Year. She went on to become Georgia’s 2014 Teacher of the Year. She spent the last year traveling locally and nationally discussing many of the hot topics in education and being an advocate for the good work being done in education. She is currently working on her Ph.D. in Education Theory and Practice with certificate in Interdisciplinary Law and Policy at the University of Georgia. She also serves as a supervising instructor for teacher candidates in the middle grades program at UGA. She is the daughter of immigrant parents and a first generation college graduate. She was born in Brooklyn, New York and raised in Decatur, Georgia. 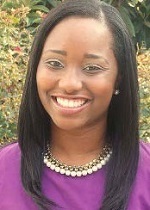 She received her Bachelor’s degree in Education with a concentration in Special Education and her Master’s degree in Education with a concentration in Teaching and Learning from Georgia Southern University. During her tenure at Georgia Southern University, she traveled nationally and internationally to collect data from various educational systems in order to find ways to make improvements and validate the successes of our local systems. Jemelleh believes that greatness lies within every student and sometimes it takes a little ingenuity to let it shine through. While pursuing her terminal degree, Jemelleh serves as a Teacher Leader for the National Network of State Teachers of the Year, advisory councilman for the Georgia Partnership of Excellence in Education, board member for the Georgia Cyber Academy, advisory councilman of Georgia’s Network for Transforming Educator Preparation, NAACP State of Georgia Education Committee Co-Chair, and board member for Georgia Southern University Alumni. She continues to travel the nation to give keynote addresses and workshops.